Your First Choice For Oriental Rug Cleaning! Call Now! Sincerely Yours has dedicated over 2,200 square feet of space for custom oriental rug cleaning and hand washing. Our trained technicians will perform a thorough inspection to determine which cleaning method is best for your treasured heirloom. Our proven method includes vacuuming, dusting, pre-spotting, washing, drying, detailing, fringe cleaning and finishing. Your rug is inspected after every process to ensure it meets our high standards. We do not hesitate to repeat any step(s) that require special attention. Why Sincerely Yours For Your Oriental Rug Cleaning? Not all oriental rugs are created equal. They have different weaves, style, and dyes, which dictate how they are cleaned. Our oriental rug cleaning process makes sure that your rug is brought back to its original beauty, and its value is protected for years to come. Our oriental rug cleaning is a multi-step process designed to maximize efficiency and effectiveness without compromising delicate dyes or weaves. View the steps below. Every rug is inspected to determine the best cleaning method for your treasured rug. Our inspection includes fiber identification (natural vs. synthetic), rug construction, colorfastness, testing for pet urine and other areas that may require special attention. Your rug is cleaned front and back using our pile lifter, a specially designed vacuum with two separate motors. Your rug is then moved to our “rug dusting” area. Your rug is placed face down on our grating system, where the back of the rug is beaten using the RugBadger system. The RugBadger uses over 40,000 harmonic vibrations a minute to remove the most stubborn soil and sediments that are caught deep in the fibers. The grating system allows these soils to drop clear of your rug and fall to the floor. Your rug is again vacuumed front and back with our pile-lifter vacuum. Your rug is now ready for cleaning in our custom rug cleaning bay. We will employ a rug cleaning process best suited for your rug based on our inspection. Rug cleaning methods include Absorbent Compound, Absorbent Pad, Dry Cleaning, Mist and Brush, Rotary Shampoo, Hot Water Extraction and Immersion. Most rugs are best suited for the Hot Water Extraction or Immersion process. The newest addition to our wash process is the “rinse” cycle in our centrifugal rug wringer. This is similar to the spin cycle on your washing machine. Once your rug is washed, is it goes into our 13’ stainless steel centrifuge. We flush out the detergents and introduce clean, fresh water while your rug is spinning at 1400 RPMs. The centrifugal force will virtually remove all the water from your rug. 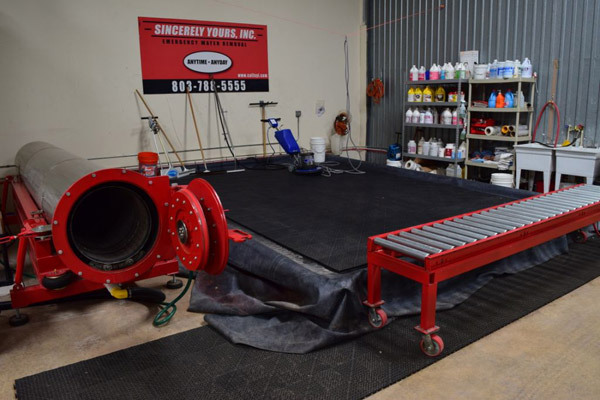 Sincerely Yours is the only rug cleaner in Columbia that has a centrifugal rug wringer! Your rug is transferred to our custom drying tower, where high-velocity fans are used to dry your rugs quickly. Moisture-sensing equipment is used to guarantee every rug is dry before it is removed from our drying area. After your rug is dry, we perform our post-rug-cleaning inspection to ensure it meets our high standards. Any step will be repeated if the rug does not pass our quality-control inspection. 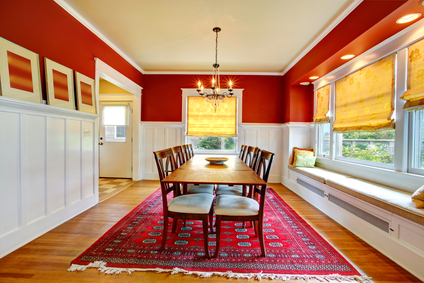 For oriental rug cleaning, your rug is now ready for fringe detailing and cleaning. All fringe work is performed by hand to ensure optimum results. Another vacuuming with our pile-lifter after the rug is cleaned with the Yorkster 500. The Yorkster 500 uses an orbital motion of 1800 oscillations per minute to massage the rug fibers. This results in a soft and fluffy rug that makes the colors truly pop! Your rug has now been successfully cleaned and is ready for wrapping. Your rug will be wrapped in 100 percent virgin Kraft paper. This will keep your treasured rug clean until it is ready to be displayed in your home. Sit back and enjoy how your newly cleaned rug brings your room to life! Click here for more information about animal urine on rugs and carpets.